Whether these Dark Chocolate-Dipped Figs with Gorgonzola Cheese are served as an appetizer or dessert, your guests will fall in love. 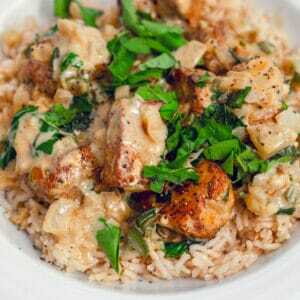 The ingredients are simple, but they all work so well together. Happy September! I just heard there are only 17 weekends until Christmas, so that’s a thing. No, I’m not freaking out or anything. Trying to stay in the moment for now… Which is SUMMER. Come on people, fall doesn’t start until the end of September, so let’s stop saying it’s fall already. Not that I’m not looking forward to it a little bit… While summer is my favorite season weather-wise, I think fall is my favorite season mental-wise. Mental-wise? I just feel as though I’m in a better, more relaxed place mentally. Probably because there’s not so much omg pressure to get our and enjoy the summer before it passes. Also, my couch is comfortable and I enjoy cider. And yes, pumpkin spice (sue me). Butttt I also like figs. And figs are the kind of fruit that go from summer to fall without blinking an eye. You have to respect them for that. And there are soo many things you can do with them. My personal favorite is a fig, prosciutto, arugula, and balsamic flatbread. But I’ve had chocolate-dipped figs on my mind for quite a while lately. And last week I was craving chocolate and gorgonzola cheese. Together. I have no idea why, but once I got it in my head, I couldn’t get it out. 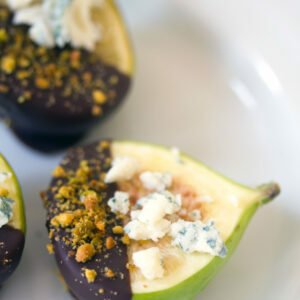 So, I dipped these figs in dark chocolate, sprinkled some crushed pistachios on the chocolate and then topped them with gorgonzola cheese. 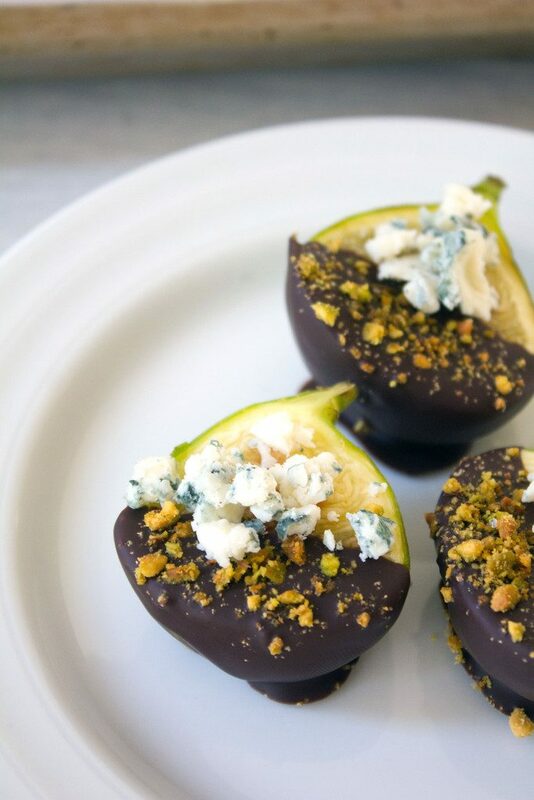 Yup, chocolate figs with gorgonzola cheese. And my dreams came true. This was seriously so simple, but also so, so perfect. 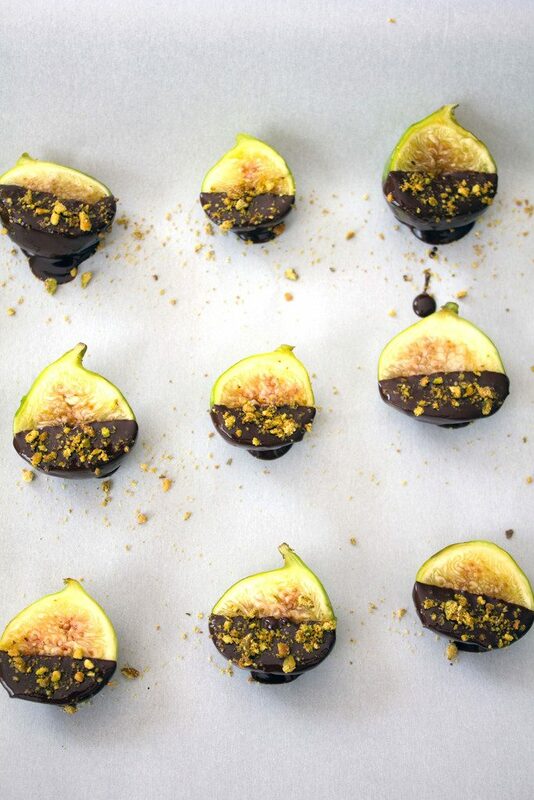 I’m not really sure if I should tell you to make these chocolate-dipped figs as an appetizer or a dessert. I guess it really all depends on what else your meal or party is consisting of. There’s really nothing wrong with a little dark chocolate at the start of a meal… And cheese is always an acceptable way to begin or end a meal. Of course, you could just think of these as a meal in themselves if you’d like. That’s pretty much what I did. And I don’t regret a thing. Fruit, cheese, chocolate, and nuts. That sounds like a well-rounded meal to me! Are you the kind of person who focuses on making goals at the beginning of the year in January the beginning of the school year in September? Orr maybe you’re one of those unreasonably smart people who makes goals all year long (if so, congratulations and I hate you). I’m much better at making goals when it’s the start of the year and I have my brand new life planner, which I’m aware is really quite sad. But I’m hereby vowing to get down to blogging business now that September is here. 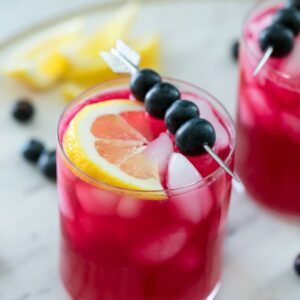 More consistent posting and making my way through the backlog or awesome recipes I have ready to go. Which means that instead of falling asleep on the couch with my computer open on my lap, I’ll actually finish posts and hit publish. Which also means I need to get to bed much earlier than I do, so that I’m not falling asleep on the couch immediately after I eat dinner. This is what September goals are all about to me. And now that I wrote it here, I have to follow it. Right?? Right?? Let’s just pretend that’s how this works. While we’re at it, let’s also make a goal to eat chocolate figs with gorgonzola for an appetizer and dessert at least a couple times before fig season is over for good. If you’re looking for other awesome fig recipes, check out my recipe for caramelized figs (omg sooo good!) or my fig, prosciutto, and ricotta flatbread. Place dark chocolate in a small heat-proof bowl set over a saucepan of simmering water. Stir chocolate occasionally until it is fully melted. Alternatively, you can melt chocolate in the microwave, heating and stirring at intervals. Dip bottoms of sliced figs into melted chocolate and set on parchment paper-covered baking sheet. Sprinkle crushed pistachios over chocolate. Place baking sheet in refrigerator for about 30 minutes, until chocolate is hardened. Top figs with crumbled gorgonzola cheese and serve. 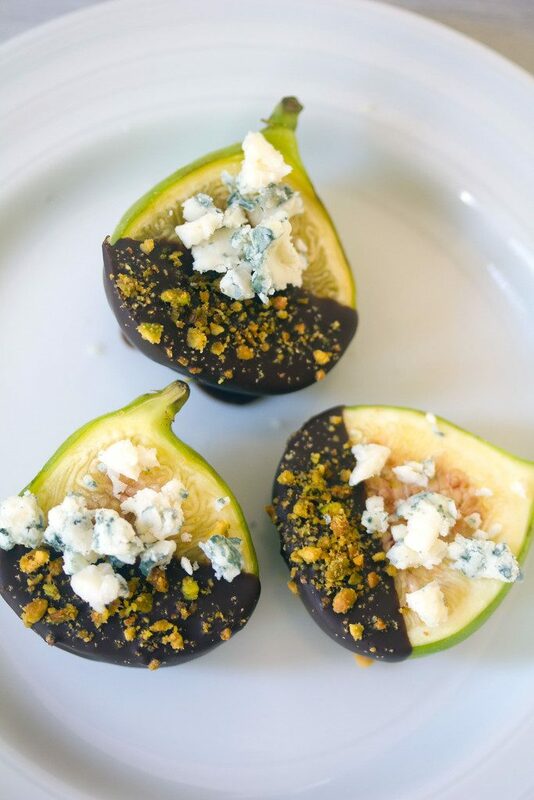 11 Responses to "Dark Chocolate-Dipped Figs with Gorgonzola"
I’m super excited for fall too, but I do think all the fall foods popping up and people saying “it’s fall” need to slow their roll. Im all about living life in the moment and currently it IS still summer! Glad to know I’m not alone in that feeling!! 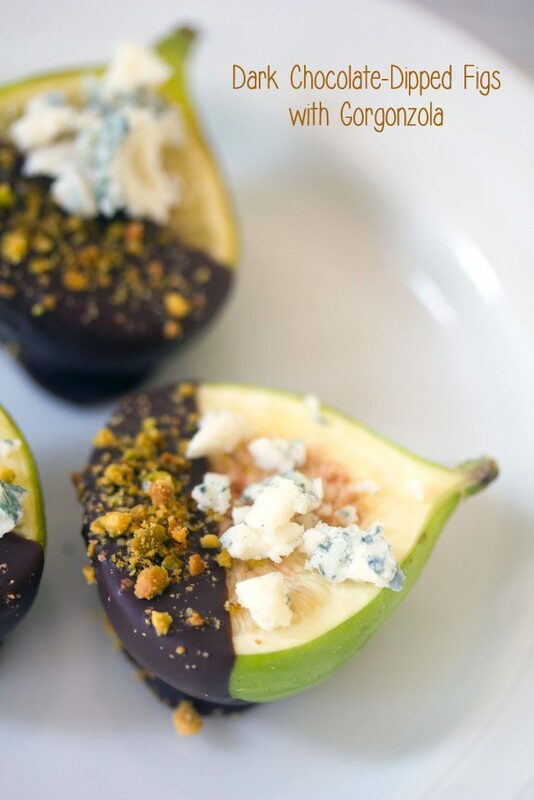 😉 l love figs, so these chocolate dipped figs with gorgonzola look crazy good to me!! I’ll take 3 dozen! Cheers, girlie! Yum! Great combination of flavors, textures, and colors. They look so pretty and tasty. This looks amazing! I have a huge backyard fig tree and when the figs come into the season I am always looking for ideas. 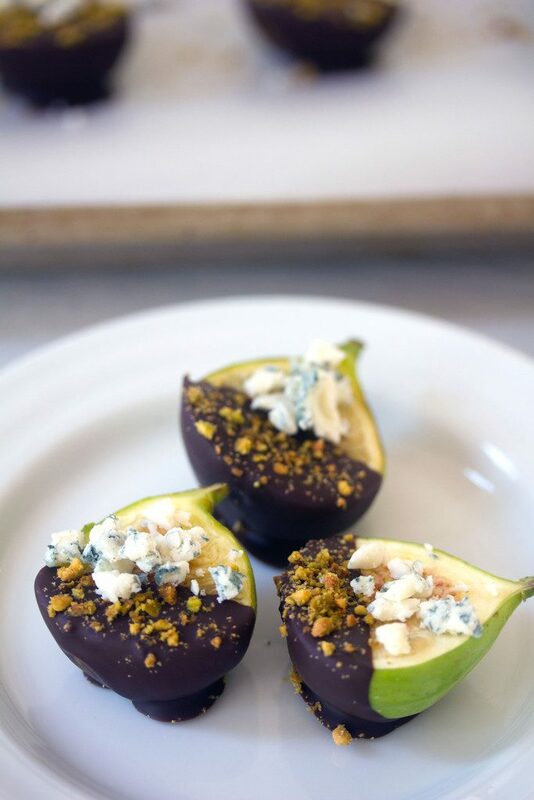 Typically, I top with blue cheese and wrap it in prosecution and broil for a couple of minutes….The idea of figs dipped in chocolate is delightful!!! Fall is my favorite season 🙂 Cannot wait to say goodbye to summer temps. You are so cool – I would have never thought of this, and I LOVE the idea. Sounds absolutely amazing! Pinned :). 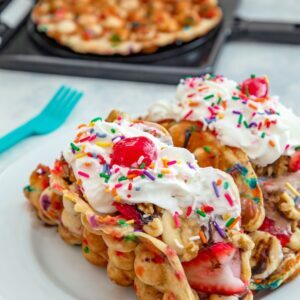 oh wow do these sound good! what a fun combo. I love throwing figs in a big salad with gorgonzola cheese in the mix. This has to be one of the best ways to enjoy figs! One of the most beautiful individual desserts I have ever seen. 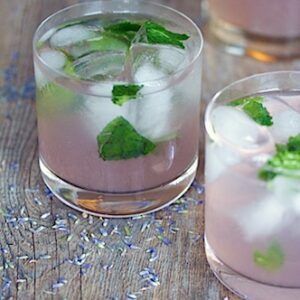 What a gorgeous combination of flavours!